Apple's getting rather good at recycling and re-issuing its top products, isn't it? The new iPad Air has launched, with the tagline 'Power isn't just for the pros'. Another line could be 'Power ripped from the Pros'… as the new iPad Air is almost identical to the iPad Pro 10.5, the device launched in 2017, but updated with a couple of internal tweaks and an all-new name – while removing nearly all reference to the iPad Pro 10.5 from its site. Crucially, it's been given a huge price drop as well – meaning Apple has essentially just slashed the price of one of its Pro models and found a way to make it a 'headline' iPad sale for the next couple of years at least. It's an interesting move, and shows the shift in how Apple is approaching the creation of new products. Let's take a quick look at what's actually the same here though. The chassis, screen and Smart Connector are all identical. The Touch ID sensor is there, the Pencil support is for the older model (not the wirelessly charging one), the Lightning connector remains and the stereo speakers are the same. There are a few differences though: the camera on the older iPad Pro 10.5 is 12MP with an f/1.8 aperture, where the new Air is just 8MP with f/2.4, as the 'non-pro' users wouldn't need it as much presumably. The weight is a touch lighter on the iPad Air (we're talking a few grams), the screen possibly doesn't support 120Hz refresh on the newer model, and battery capacity is slightly lower. That latter spec won't be noticeable though, as Apple has packed in the far more powerful and efficient A12 chipset, over the A10X Fusion seen in the iPad Pro 10.5, so the 10-hour battery life is apparently preserved. That's key: the new iPad is around 33% cheaper but is far more powerful. In just using the same manufacturing techniques it's developed already, the cost of production is reduced and means less wastage too, as it can maintain many of the same parts. In an era where the 'big new thing' is often massively different for the sake of it, having something that just rebadges the older tech and boosts it where needed is a neat move – both from a cost perspective and environmentally. 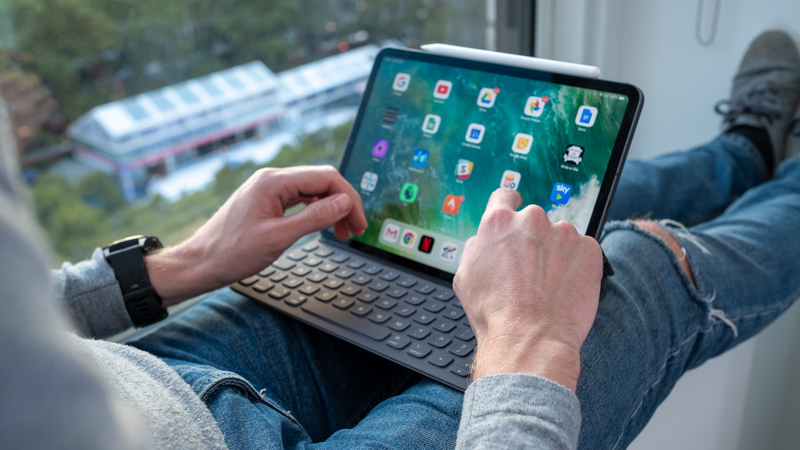 By shifting the 'Pro' moniker from the iPad Air, it also makes it feel more accessible – the distance between the base-level iPad and the next most-powerful model has closed significantly and could incite more people to spend a little more, especially as there's now the option of the Smart Keyboard too. However, it's worth remembering the overall cost of this iPad is still a fair bit higher than the $499 / £479 / AU$779 base price if you want to kit it out with all the accessories. The Smart Keyboard is an extra $159 / £159 / AU$235, and the Pencil an extra $99 / £89 / AU$145. It's, of course, entirely up to you if you want to go for these options, and if you're just after a spot of extra power then it's your choice on whether you want to spend a little more cash. It feels a little bit tired to draw on this trope though: like most things Apple, you can spin the line of 'it's too expensive!' when you write about the headline price. The whole point of Apple's multi-choice line up is that you pick the flavor you want / need. The new iPad Air lacks the 512GB option, but that was always an expensive, but useful, option for those wanting to use the Pro 10.5 in a professional capacity. With the question of whether you go for the basic iPad from last year or the new iPad Air, you're also getting a lot more screen and (possibly, as we've not had this confirmed) the powerful four speakers that bring an extra dimension to multimedia playback. The iPad Air is Apple's statement that the needs of the 'pro' have moved on, and the spec list it was offering with the Pro 10.5 simply wasn't enough – although still would be desirable for some consumers, so it shaved off a few small specs that the more casual user wouldn't use (because if the iPad is your main weekend camera, you've got a problem) and brought the price down. It's also kept the Lightning connector, as well as the 3.5mm headphone jack… the loss of both of these on the new iPad Pro 11 and iPad Pro 12.9 is one of the most irritating parts of the tablet, and would be sorely missed by the non-pro users. So with the iPad Air, you're now getting almost everything the impressive iPad Pro 10.5 offered for a lot less – and if you need the raw power as well as a top-end screen then the higher-end iPad Pro range still exists for you to sample. However, there were very few rumors that pegged these new iPads to launch today, so spare a thought for anyone that spent hundreds more on a Pro 10.5 in the last month… they're going to be using that superior camera as hard as they can.